16:10 AFP repeat unverified Hamas claim that ”one child was killed” in strike on media center. No explanation why the child was there. 16:10 Foreign media continue to repeat unverified Hamas claims of death of children. In an aerial attack on a Hamas media center in a building that includes AFP offices, the news service quoted Hamas as saying ”one child was killed.” There was no explanation why the child was in media offices. 16:00 Anti-Israel agitators have staged several riots in the Judea district and the Samaria region. Disturbances were recorded in Kalandia, near the Ofer Prison, near Bethlehem and in the south Hevron hills. 15:25 Russia condemned the bus bombing in Tel Aviv as a "criminal terrorist act" and renewed calls to halt violence in Gaza. "We are renewing our call on the sides to immediately put an end to the military confrontation," said the Russian foreign ministry. 15:19 Air Force kills Islamic Jihad terrorist operating rocket launcher in central Gaza. 15:16 Code Red warnings of incoming rockets on Sha’ar HaNegev and Eshkol regions. Rockets apparently exploded in open areas. No injuries. 15:08 Air Force bombings of terrorist targets killed five terrorists in a strike in the past hour. 15:04 A ceasefire agreement, if it is reached, is not imminent, according to unconfirmed Arab sources. 15:01 The White House denounces the terrorist attack on the bus in Tel Aviv. Mahmoud Abbas silent. 14:53 Clinton concludes her meeting with Netanyahu, Barak and Lieberman and flies to Egypt. 14:20 The IDF is bombing terrorist targets in Gaza and reportedly killed a three-man Hamas terrorist rocket launching cell. 14:13 Gaza's ruling Hamas terrorists and affiliated terrorist groups have fired 1,408 missiles and rockets at Israel since the beginning of Operation Pillar of Defense, eight days ago. 13:38 Egypt says authorities have confiscated trucks carrying 108 explosive warheads for Grad missiles. The weapons were being smuggled from Libya. 13:31 Abbas said Hillary Clinton “was the key” to a ceasefire he hopes will be announced before she leaves the country. 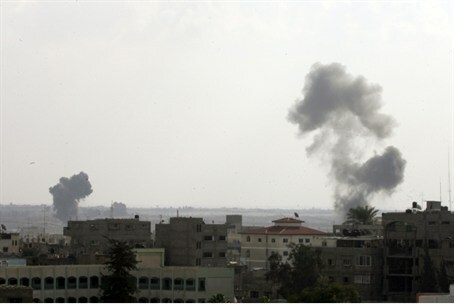 13:26 The Israeli Air Force is carrying out bombing missions on terrorist targets in Gaza at this moment. 13:04 Code Red early warning of incoming rocket on Western Negev. 12:48 Update: Gaza Arabs celebrated the attack, and Hamas officials said it was carried out in revenge for Israeli aerial bombings in Gaza that killed several members of one family. 12:33 Iran reportedly is trying to scuttle any ceasefire agreement. Analysts have viewed the hostilities as a proxy war between Israel and Iran. 12:23 Code Red early warning siren of incoming rocket on the Eshkol region near Gaza. 12:21 Update: A terrorist has blown up a bus on Shaul HaMelech street in central Tel Aviv. At least three people are seriously wounded. 12:00 One person lightly wounded in another missile attack on Be’er Tuvia, near Kiryat Malachi,. Iron Dome intercepts four missiles. Four others explode in open areas. 11:41 A member of the Palestinian parliament will visit China to discuss the violence in Gaza, Beijing's Foreign Ministry said Wednesday, as fighting continued to rage in the region. 11:39 Clinton will meet a second time with Netanyahu, Barak and Foreign Minister Avigdor Lieberman in Jerusalem after having talked n Ramallah with Abbas. 11:20 Two more rockets hit the Eshkol region, this time without setting off the Color Red alert siren beforehand. The attacks did not cause physical injury. 10:57 Iron Dome has intercepted at least 12 missiles this morning, Code Red siren for rocket on Nahal Oz, next to Gaza. 10:50 Code Red early warning siren for incoming rocket on Kibbutz Be'eri, whose fields are adjacent to Gaza. 10:36 Hamas missile hits home near Kiryat Malachi, House on fire’ elderly women escapes injury. 10:34 Twenty rabbis toured areas of Southern Israel as part of an emergency solidarity mission of the Rabbinical Council of America. 10:26 Iran bears a "heavy responsibility" in conflicts in the Middle East, especially in Gaza, French Foreign Minister Laurent Fabius said Wednesday. 10:23 U.S. Secretary of State Hillary Clinton is meeting with Palestinian Authority Chairman Mahmoud Abbas as part of her efforts to reach a ceasefire agreement. 10:18 Three siren warnings of missile on Sderot, communities north of Ashdod and Kiryat Malachi. 10:13 Israel's Tourism Ministry has hundreds of thousands of shekels' worth of aid for southern Israel after Operation Pillar of Defense ends. 10:00 Iron Dome blows up four missiles aimed at Be’er Sheva and Ashkelon. Several other rockets explode in open areas. 9:57 Warning sirens of second barrage of missiles and rockets on Ashkelon and communities to the north. 9:50: “The fighting between Hamas and Israel has put Morsi's new government in the spotlight, testing his influence with Hamas and his international stature, reports The Los Angeles Times. 9:41 Hamas launches new barrage of missiles. Sirens warn of attacks throughout the south. 9:40 Early warning siren of missiles on the Ashkelon industrial area and Be’er Sheva. 9:37 An Air Force drone killed one terrorist in a strike on Jabaliya in northern Gaza, and the Air Force continues to bomb terror targets in southern Gaza near the city of Rafiah, which straddles the Egyptian-Gazan border. Hamas and allied terrorists have attacked Israel with more than 1,000 rockets and missiles since then, not including those fired in the past week during the Pillar of Defense operation. 9:07 Multiple early warning sirens of incoming missiles from Ashkelon to Kiryat Malachi, located halfway between Be’er Sheva and Tel Aviv. 9:00 Rocket explodes in open area near Sderot, No injuries or damage. 8:53 Twenty-three people injured in rocket and mortar shell attacks in Israel in recent days remain hospitalized as of Wednesday morning. Three are in serious condition and have recently been through surgery. 8:37 The IAF has hit over 1,500 terror targets in Gaza since fighting began last week, including dozens on Tuesday night. 8:30 Early warning sirens of incoming missiles on Ashkelon. 8:09 IDF spokesperson Brig. Gen. Yoav Mordechai says a ground operation in Gaza still is an option despite Hamas’ stated assumptions of a truce. 7:45 The city of Rishon LeZion announced Tuesday night that the school system in the city will operate partially on Wednesday. 7: 31 Egypt and Israel are engaged in a war of words over a possible ceasefire as Hamas continues to attack Israeli civilians and Israel retaliates. 7:29 Code Red early warning siren of incoming missile towards Ashkelon. 7:05 Funeral for Yosef Fartuk of Emmanuel, in Samaria, who was killed in a mortar shell attack in the Eshkol region Tuesday, will be held at 1:30 p.m. at Givat Shaul, in Jerusalem. 6:56 Hamas terrorists woke up Sderot with a rocket attack. Code Red siren gave residents 15 seconds to run for shelter. 5:00 Rockets explode in open areas near Ashdod. 2:00 The Iron Dome anti-missile system intercepted two rockets that were fired towards the city of Ashdod. No one was hurt. 1:35 An IAF airstrike hit the building housing AFP's Gaza City office. The IDF Spokesperson confirmed the hit, explaining the building was attacked because it housed a Hamas military intelligence operations room. No AFP reporters were hurt. 1:15 The IDF continued to strike dozens of terrorist infrastructures in Gaza, including tunnels that are used to smuggle weapons and tunnels through which fuel is transferred to terrorists. 00:10 Four rockets fired by Gaza-based terrorists exploded near a community in the Eshkol Regional Council. There were no reports of physical injuries.